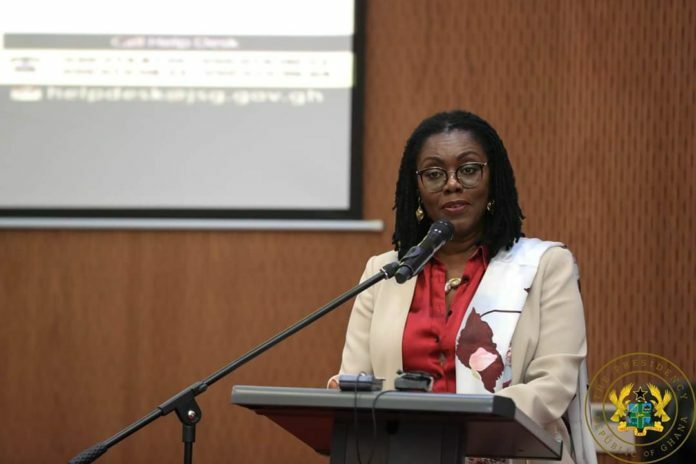 Communications Minister Ursula Owusu-Ekuful has asked all Metropolitan, Municipal and District Assemblies (MMDAs) to consult the National Information Technology Agency (NITA) before deploying ICT infrastructure and applications. Mrs Owusu-Ekuful gave the directive last Wednesday when she spoke at the formal launch of the Judicial Service’s e-Justice Project at the auditorium of the Law Court Complex in Accra. It also interfaces with the Digital Transcription Systems (DTS) for the digitization of courtroom proceedings and transcriptions. Mrs Owusu-Ekuful said from her prepared speech that the Communications Ministry is aware of the need to continuously improve on ICT infrastructure, develop the necessary human resource and business processes by taking into account the entire operations of MMDAs and their interactions with the public and other government agencies. That notwithstanding, they are encouraged to use applicable minimum ICT standards, protocols, guidelines and procedures spelt out by NITA and the e-Government Interoperability Framework and Ghana Government Enterprise Architecture to ensure the reliability of shared services. “All MDAs are advised to consult NITA before deploying ICT infrastructure and applications,” she cautioned. Touching on the e-Justice Project, Mrs Owusu-Ekuful expressed in the fact that Ghana’s justice sytem is witnessing a remarkable transformation under the leadership of President Akufo-Addo. “Indeed, as a lawyer myself, I am confident that the era of missing dockets, misplaced legal documents, poor record keeping and resource management are now things of the past, as the Judicial Service of Ghana has been assisted with an e-Justice System in 43 High Courts to improve on the effectiveness and efficiency of justice delivery in Ghana,” she said. Mrs Owusu-Ekuful said from the filing of processes to final delivery of judgement, the impact of digitisation in faster services, prompt notification, and efficiency of delivery will be the user experience of all, from the parties in the case, registry staff, lawyers and judges. Congratulating the Chief Justice for demonstration strong leadership to ensure the implementation of the e-Justice Project went smoothly during the period, Mrs Owusu Ekuful warned that digitization alone will not bring the necessary benefits if the beneficiaries do not show ownership of the processes. “I commend the Judicial Service for its exemplary attitude during the project design and implementation phase. It led the active training and capacity building of all users, judges, lawyers and judicial service staff and hopefully, will continue with the operations and management of the infrastructure provided. This exemplary conduct is worth emulating by all other eTransform beneficiary agencies. The 43 high courts in the Law Court Complex in Accra are the beneficiaries of this phase of the eJustice implementation,” she said.